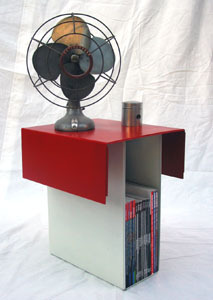 This small side table also functions as a magazine rack and is made from two sheetmetal CPU covers. The magazines are important part of the design as they add extra weight to the base and make the table more stable. Instructions for how to make it are included in the Writing portion of the site. I'd like to develop the basic idea further and make one from scratch using water jet cut steel or aluminum. I'd perforate the sheets on the fold lines so that it could be flat packed and bent into shape by the end user like BluDot's magazine racks. A small drawer above the magazines might be nice too.